Mr. Etzrodt represents and advises individuals in a wide range of matrimonial and family law matters, including equitable distribution of assets, spousal and child support, child custody and access, and prenuptial, postnuptial and separation agreements, whether such matters are resolved through negotiation and settlement or when necessary through litigation at the trial and appellate court levels. Upon graduation from law school, Mr. Etzrodt worked for a general practice firm, representing clients in many different areas of the law, including matrimonial and family law, real estate, trusts and estates, personal injury and criminal matters. 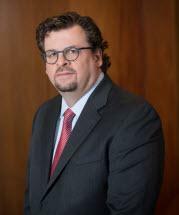 Since 2006, Mr. Etzrodt has practiced exclusively in the area of matrimonial and family law. Mr. Etzrodt successfully completed the American Bar Association's Family Law Trial Institute course in 2007 and was recently appointed to the First Department’s Roster of Neutral Evaluators for the Matrimonial Neutral Evaluation Program. Prior to attending law school in 1993, Mr. Etzrodt worked for eight (8) years as an entrepreneur, developing and managing various business interests in the hotel and restaurant industry, as well as managing various real estate interests. Mr. Etzrodt earned his B.A. in business administration and accounting from Franklin & Marshall College and his J.D. from Brooklyn Law School.